Coming this May, I will be featuring a booth at the Calistoga Farmer’s Market from 8am to 12 noon on Saturdays from May to the last week in October. This is a fun event that brings lots of people together throughout the summer months. 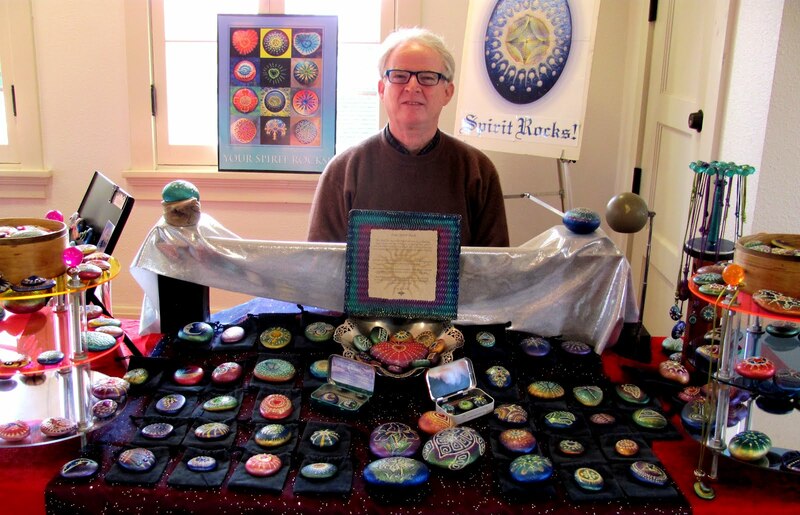 The Spirit Rocks will be on display in prices ranging from five, up to thirty dollars. Come by and see all the new creations and enjoy the live music that will be heard during the market. Everyday I find a new and different way of embellishing these ocean rocks. If it isn't with a new color of paint, it could be from a dot of glitter that looks good adhered to these rocks.Unless someone wants a particular design or motif, I generally work with color, and many of the Spirit Rocks I produce look similar only because I have a formula that I have developed which works. If pushed, I can come up with a fairly attractive rock in about a half an hour. I will usually prepare four or five rocks at a time. Then, as one is drying I will begin on another rock and go back to the first one. It is almost like a production line from the beginning to the end of the day. I love sitting down, putting on some good music and a pot of coffee, and then just paint. I took a group of rocks that I had painted and scanned them. After saving them, I brought the image into Photoshop and applied the twirl distortion filter to it. It ended up revealing a rather compelling picture that resembles a coil of some sort. 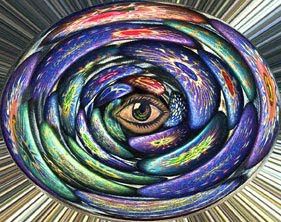 After achieving this effect, I took a picture of a rock that I had painted of an eye and placed it at the center of the coil. These are only some of the enjoyable processes that I have applied to these wonderful art objects.